Our product range includes a wide range of siemens plc s7 1200, siemens plc s7 300, siemens plc s7 400, siemens s5 plc and siemens logo plc. We are offering S7 1200 PLC. These Basic controllers are the intelligent choice for applications in the low to mid-performance range. They are available in standard and safety versions. The integrated inputs and outputs as well as the integrated technology functions facilitate both compact and cost-effective solutions. With basic controllers, flexible solutions for simple networking with integrated and optional communication connections can be implemented. The SIMATIC S7-1200 is the controller for open-loop and closed-loop control tasks in mechanical equipment manufacture and plant construction. Due to the compact modular design with a high performance at the same time, the SIMATIC S7-1200 is suitable for a wide variety of automation applications. Its range of use extends from the replacement of relays and contactors up to complex automation tasks in networks and within distributed structures. The S7-1200 also increasingly opens up areas for which special electronics was previously developed for economical reasons. 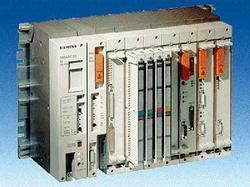 We offer wide range of Siemens PLC S7 300. We ensure the complete range conforms to international quality standards and accomplishes the complete requirement of the customers. 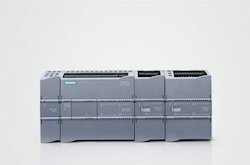 We have excellent range of Siemens PLC S7 1200 which have an excellent designs and they provide a high quality of integration between the controllers and provide an effective performance to the clients. It offers very accurate and precise carrying out of the automation tasks. The SIMATIC S7-1200 system is available in five models, CPU 1211C, CPU 1212C, CPU 1214C, CPU 1215C and CPU 1217C. Each can be extended to meet any machine’s requirement. The digital and analog I/Os can easily be expanded without affecting the physical size of the controller by installing a signal board inside the front of the CPUs. Connecting signal modules at the right side of the CPU increases the digital and analog I/O capacity even further. CPU 1212C can accommodate two, and CPU 1214C, CPU 1215C and CPU 1217C up to eight signal modules. communication, AS-i and more Fieldbus systems. We are offering Siemens PLC S7 400 to our client. 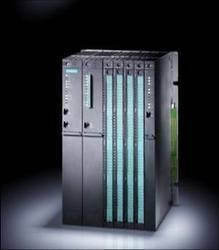 We offer wide range of Used Siemens S5 PLC.The S5 PLC is used preferably to coordinate overall plants and to control lower-level systems. This product is made for meeting the automation demands of industrial processes such as control of machinery on factory assembly lines. 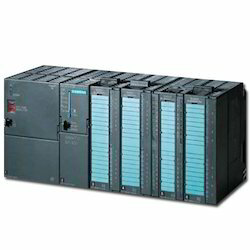 We offer wide range of Siemens LOGO PLC. The LOGO! logic module is the convenient, user-friendly solution for simple open-loop and closed-loop control tasks. Building services/electrical installation sector (lights, blinds, awnings, gates, access control points, barriers, ventilation systems...). Mechanical engineering (pumps, small presses, compressors, lifting platforms, conveyor belts ...). Pure versions, cost-optimized without key control panel and display. Key control panel and display in one device. Further tools are not required. Power failure-proof backup of switching program and setpoints (e.g. timers) due to integrated EEPROM. e.g. LOGO! 230RC: 72 x 90 x 55 mm (W x H x D). Adapted installation in the distributor box (same dimensions as ground-fault circuit interrupter).